← 12th Man: Are Wigan Wembley bound? Prior to the match, Rochdale manager Keith Hill assessed Wigan’s promotion chances when he said: “They’ll be in the top two. There’s no question in my mind that at the end of the season they’ll be in the top two”. “Sometimes it takes big football clubs a certain amount of time to settle in and understand the league that they find themselves in, but they’ve found out and understood the league very early”. Latics certainly looked like promotion challengers in this Lancashire derby and ran out deserved 2-0 winners. Wigan opened the scoring on 16 minutes through a Jason Pearce header following a Michael Jacobs free kick and it was something of surprise that they were only one goal ahead at the interval. Dale had a chance to draw level after the break when Joe Bunney lifted the ball over the crossbar from close range after Jussi Jaaskelainen fumbled a cross. But Latics sealed the three points on 61 minutes when Yanic Wildschut outfoxed Rhys Bennett and pulled the ball back to Michael Jacobs who fired home via the underside of the crossbar. Wigan manager Gary Caldwell made three changes from the last league match against Swindon. New loan signing Alex Revell went straight into the team, with Craig Davies and Jason Pearce replacing Chris McCann, Donald Love and Will Grigg. Latics were quickly out of the traps and had their first effort on goal after five minutes, when Donervon Daniels shot from the edge of the box was well turned away by Dale keeper Josh Lillis. Daniels headed over soon afterwards before Craig Davies side-footed wide after collecting a long pass from Pearce. But it was not long before Latics went ahead. Michael Jacobs curled a free-kick to the far post and Pearce dived to head the ball home past the Dale keeper. Jacobs then had two great opportunities to increase the lead, but his first effort went wide and the other was deflected for a corner. Latics had dominated the opening half, but went into the interval only one goal to the good. Keith Hill must have given his players a talking to at half time as Rochdale attacked from the kick off. Joe Bunney might have equalised but he lifted the ball over the crossbar from close range after Jussi Jaaskelainen fumbled. But it was not long before Latics were in the ascendancy again and the points were sealed on 61 minutes when Jacobs scored his fifth goal of the season. Daniels produced a superb diagonal cross field pass to Wildschut and the Dutch winger went around his marker before pulling the ball back to Jacobs on the edge of the box, who fired it home via the underside of the crossbar. Rochdale tried to get back into the game and a curled low drive from Bunney was well saved by Jaaskelainen, but Latics were still in control and could have increased the margin of victory when Perkins unleashed a superb drive from 30 yards which produced an excellent save from Lillis. Latics are now unbeaten in ten games and are only four points off top spot in the League One table. It looks like Keith Hill could be proved right at the end of the season. 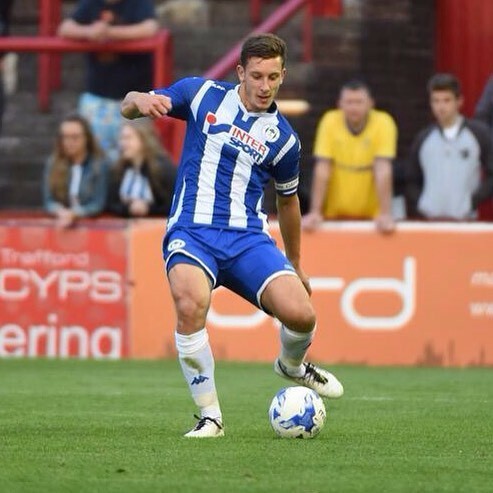 This entry was posted in Jason Pearce, Keith Hill, Michael Jacobs, Rochdale, Wigan Athletic and tagged Jason Pearce, Keith Hill, Michael Jacobs, Rochdale, Wigan Athletic. Bookmark the permalink.